When you eat a cold summer treat, it cannot literally freeze your teeth. However, pain from sensitive teeth is one reason to consider avoiding ice cream and popsicles. There are many possible causes of sensitive teeth. You may have worn enamel on one or more teeth, a fractured tooth, or cavities. Your nerves may be exposed if you have receding gums. 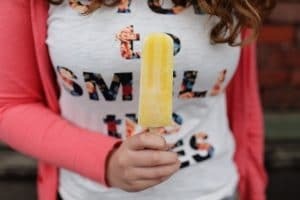 These common causes of sensitive teeth can make it painful to eat frozen treats. While everyone reacts differently to sensitive teeth, you may find the pain is not worth the effort if you eat these cold products. Even if you do not have sensitive teeth, these popular cold treats are not the best choice during the summertime. Ice cream and popsicles both contain plenty of sugar, but they may have other ingredients that harm your teeth, too. The sugary syrups can destroy tooth enamel. If you eat tasty cold treats this summer, it may result in sensitive teeth or cavities in the future. Excessively hard products, such as shaved ice and nuts in ice cream, may result in a chipped tooth when you bite into these products. Oral health is important throughout the year, but it can be a special concern during the summertime. Your kids are on summer vacation, and you may have time off from work. It can be tempting to fill the freezer with sugary treats or visit the ice cream truck whenever it comes along. For the sake of your oral health, and your entire family’s health, take a different approach this summer. As occasional treats can become a habit, start healthier habits for your family. Instead of traditional summer treats, enjoy cool, fresh fruits. You can have better oral health instead of harming your teeth.